I started the year with the goal of doing the Historical Sew Monthly, and I failed miserably at that. But that's okay, I still did a couple of the challenges and ended up with a chemissette and bustle pillow! I did finish my 1870's undergarments, with a total of 1 bustle [petticoat], 2 additional petticoats, a corset, drawers, chemise, and now boots! I also started out my year by working my Christine Daae wig (which I finally finished in November). HUGE learning curve there. I learned how to weft and ventilate, and I'm now much, much faster at both of those because of that project. I finally made my Mara Jade costume that I had been wanting to make for years! It's one of my favorite costumes! I made a new 1940's blouse, affectionately called the Sunshine Blouse. Even though I haven't posted much about it (or really gotten any pictures) I've made a lot of progress on my 1871 day dress. It's one of those projects that keeps getting pushed back due to not having any where to wear it. Other costumes have higher priority, so it just keeps getting stuffed into the UFO pile. But I'm pleased to say that I'm getting close to finishing it! YAY! I would get pictures but the bodice doesn't fit on my sewing form so I'm just gonna wait until it's finished. Again, not much of anything in the way of updates, but I've been knitting a sontag. I haven't really done much knitting this year, so it's taking longer than it probably should to get done. For the Disney party we had in October I made Alice from Alice in Wonderland. Such a fun costume to both make and wear! Then for Hallween I made Elphaba's defying gravity dress, which was another one that I had on my list to make this year! I started working on Rey from The Force Awakens and even bought the fabric. I had planned on making it for the premier but I was having fabric dyeing problems so I've decided to save that one for next year. I never posted about it, but I had my first commission this year! I made a cloak for my boss for Halloween. She loved it and it was so fun to make! Now I really want to make a cloak for myself. I also helped my brother with his Halloween costume. He went as Snape and I made the cloak for him. Unfortunately I don't think we ever got any photo's of him in it. For the Force Awakens premier I gave my old Jedi costume to my brother and finally added a bunch of snaps. I had wanted to keep it for myself, but it was too small when I tired it on and it fit him perfectly! From the top left to right. 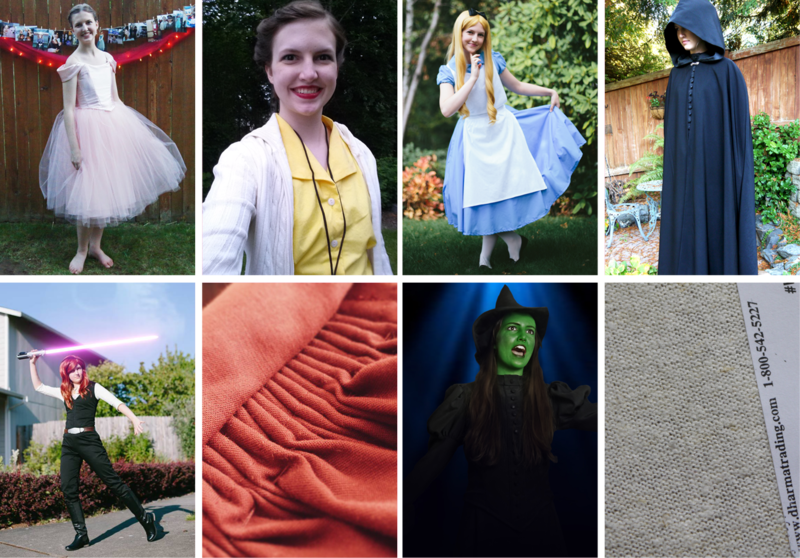 My graduation dress, the Sunshine Blouse, Alice in Wonderland, the cloak, Mara Jade, cartridge pleats on my 1871 dress, Elphaba, Fabric for Rey. On to my plans for 2016! I already have several costumes I know I have to do next year. Most of which I already have patterns and/or fabric for, and other's are one's I've been meaning to to for forever and just haven't gotten around to yet. First off is my sister's Elsa costume. I'll be starting that first thing after the new year. 1940's Sailor Dress. I purchased Wearing History's 1940's Sailor Play Suite pattern and the fabric for this this summer but never got around to making it. 1940's Suit ensemble. Because I'm working on recreating a 1949 Pan Am stewardess uniform for the Historic Flight Foundation and I've never made anything like this, I'll be making a sort of mock up for a 1940's suit jacket so I can learn the tailoring techniques used in something like this. 1949 Pan Am Stewardess Reproduction. 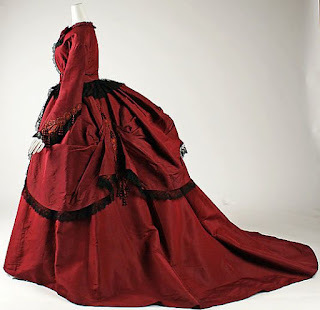 Finish the 1871 day dress. Make a new corset. I learned a lot on my first attempts and I purchased Truly Victorian 110 a while ago. I just need to make a mock up and fork out the money for good fabric. Christine Daae's Wishing Dress. I started researching this dress in summer of 2014 and I am ready to make this! It's not as high of a priory just because I don't actually have anywhere to wear this, but I'm really excited and want to start it soon. I would really like to make Belle's blue dress from Once Upon a Time. I've wanted to make this for a long time. :) Maybe for Halloween. I was on Pinterest the other day when I found this gorgeous dress. I don't know if I'll be able to make it next year, but I'm putting it on my list anyways. So with all of that I'm going to have a crazy year! It'll be fun though. I just hope I can find more events to wear these costumes to. Here's to 2016! Oooh, I love that last dress! I would totally make that, except that I have like three dresses already in that color. I think my favorite project is the Graduation dress! I am crazy interested in your Rey costume! I would love to try to make one up before the 4th as well! I am NOT that great of a sewer however and not looking to invest too much $$ in materials. So I am will be scouring for some similar looking fabrics as opposed to the "official" ones. I did have a question regarding a wig for the costume. Any suggestions on how I could replicate the hair? I have short hair, so I would need a wig that could be pulled up into a ponytail and designed as needed. I browsed the Epic Cosplay site and maybe a long haired lace front wig would work? Completely inexperienced on all things wigs and costume design, haha! Any tips would be greatly appreciated!! Love you site!! Yes, you would definitely want a lace front wig. As for length, I don't think you need a very long wig. I believe they didn't use a wig for Daisy Ridley (Rey) and her hair was just about to her collar bone. I would suggest Arda Wigs Imladris Lace Front wig in Dark Brown. I'm probably going to get that wig for myself. I have a pretty good idea on how the hairstyle is done, but my hair isn't the proper length so I haven't been able to get it exact yet. There's lots of great tutorials on YouTube though!